Mount rubber adapter with 8x25mm cap screws using a half inch heat block. 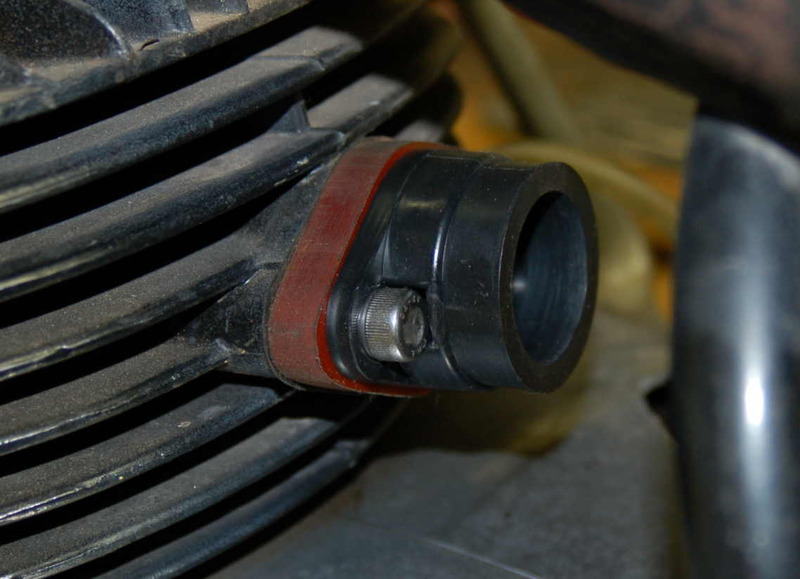 Insert clear vinyl 2" hose inside airbox hose and clamp to carburetor. For the Montesa Cota 247s that used an AMAL concentric, flange mounted carburetor we remove the long heat block and the studs in the manifold and replace the heat block with a half inch thick one. Then we add the flange adapter that comes with the Cota 247 kit and secure it with two 8 x 25mm allen head bolts. 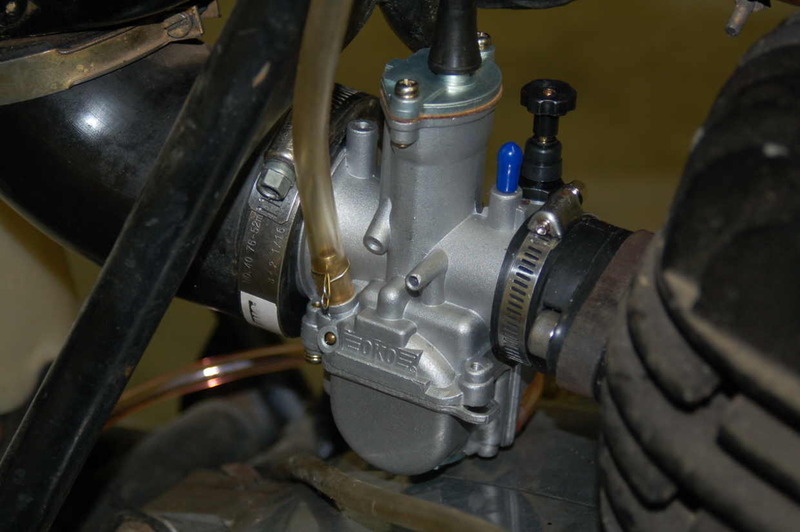 Once the OKO is fitted we place the 2" inside diameter hose piece inside the end of the Cota's air box hose and clamp the hose to the carburetor intake. The stock cable can be used. Photos show a 28mm on this bike during testing, but we switched to a 26mm for better low end. 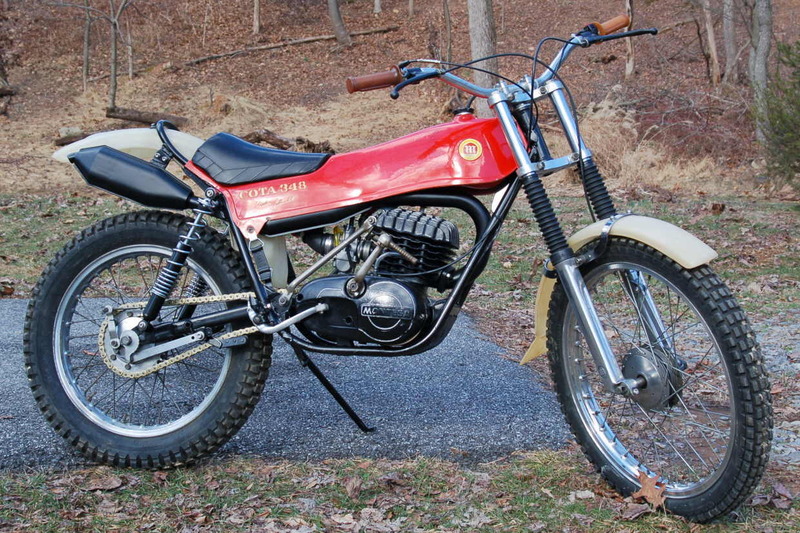 The Montesa Cota 348s and 349s used an AMAL MKII carburetor that is spigot mounted. The stock sleeve adapter may be used for the OKO, but we provide a new sleeve in each Cota 348 kit. 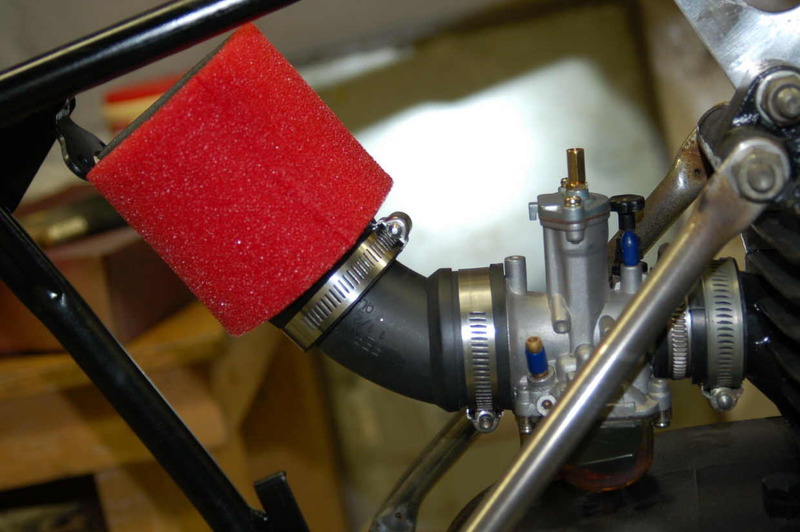 Our test bike did not have a stock air box, so we used a UNI two stage filter attached to a rubber elbow to raise it and place it behind the side panels. 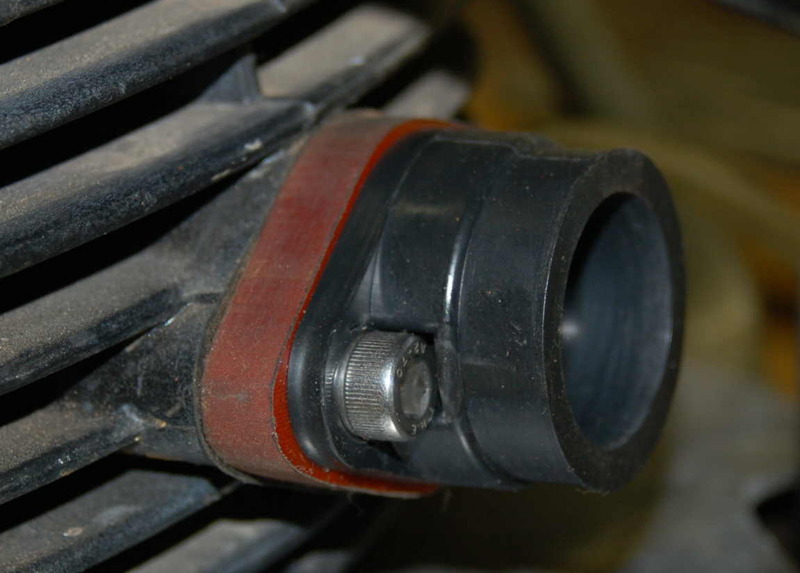 Since the AMAL MKII and the OKO both have a 49mm intake, we believe the stock air box hose should work for the OKO. The stock cable can also be used. This Cota 348 was fitted with an OKO 28mm K-101, but after much testing we are now fitting a 26mm K-101. Sometimes the 28mm is slightly lean at the cutaway. The 26mm eliminates this. Select your model Cota from the drop-down list below. Kits include adapters for either flange or spigot mounts. 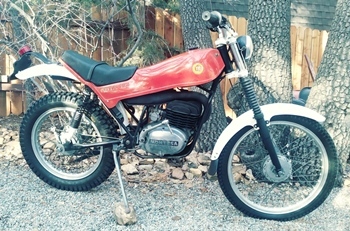 Carburetors are prejetted and include extra jets for fine tuning, if needed. Check our Sales page for accessories if a cable or air filter is needed. 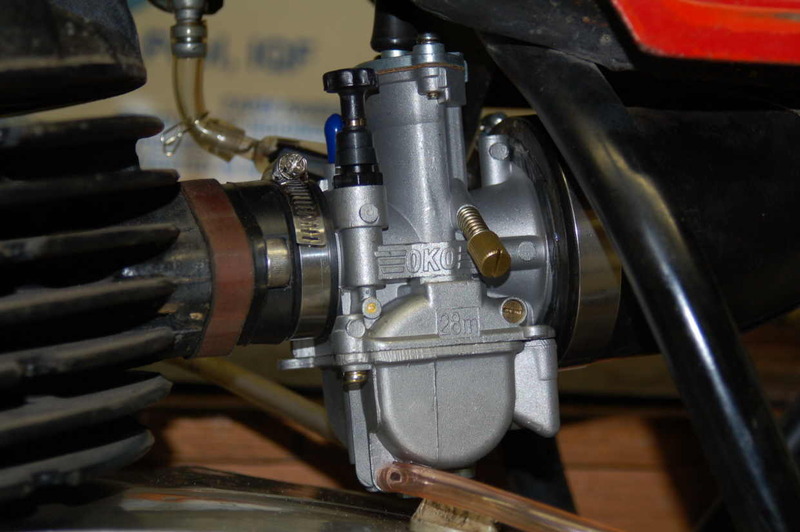 The Cota 123 used an AMAL 25mm flange mount carburetor, so the 123 kit includes the flange adapter. The heat block is very thick and needs to be replaced with a 1/2" rubber heat block as the ones that came on Bultacos. This are also included in the it. The air box hose on our test bike fit nicely on the OKO intake, and we were able to use the stock throttle cable as well. Our only complication was that the tab on the rear of the carburetor top hit a frame rail so it was filed off. We used a 21mm K-101 which is a big improvement over the 25mm AMAL. Select the shipping destination and model you want the kit for. 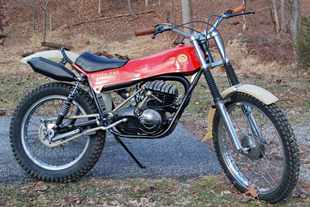 Bikes fitted by us were a mid-sixties Montesa Scorpion and a 1976 Montesa Enduro 250. 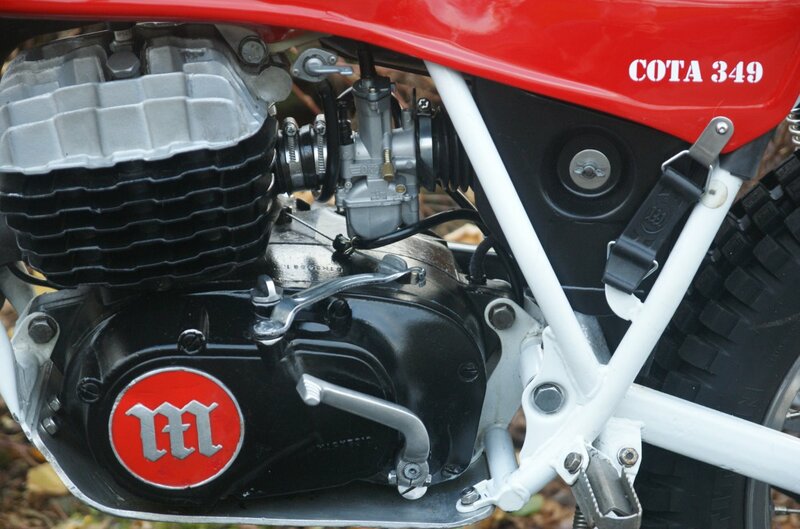 Kits are jetted for these bikes and include manifold adapters.